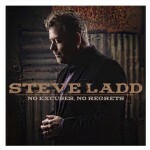 Preview and purchase Steve Ladd's Latest Single Here! Come Up Clean available for preorder! The Old Paths Announce Tour Schedule Expansion View story via Singing News HERE! Steve Ladd performs at First Baptist Atlanta!